Solid, telescopic pillar construction made of Special Aluminium profiles, anodized in silver colour. Measuring tape installed in the special C-shaped groove in aluminium profile which protects it against damages made by abrasion or accidental overturn.Two brackets for putting a crossbar - one comply with arrow indications, the other one is mounted 50 cm lower. Stand base made of heavy duty steel, powder coated. Wheels installed in the base enable easy movement. Special, self-blocking mechanism of lifting and lowering crossbar brackets by means of crane lever. This ensures comfortable operating and precise height adjustment. Height adjustment from 115 cm to 265 cm. Uprights made of special aluminium telescopic pillar construction profiles, which are bolted with 18" square roll away steel base and includes two brackets to place the crossbar, heavy duty construction for maximum stability. Comes un-assembled and can be assembled very easily by screwing four screws. Height adjustment from 160cm to 270cm. Heavy gauge steel uprights. 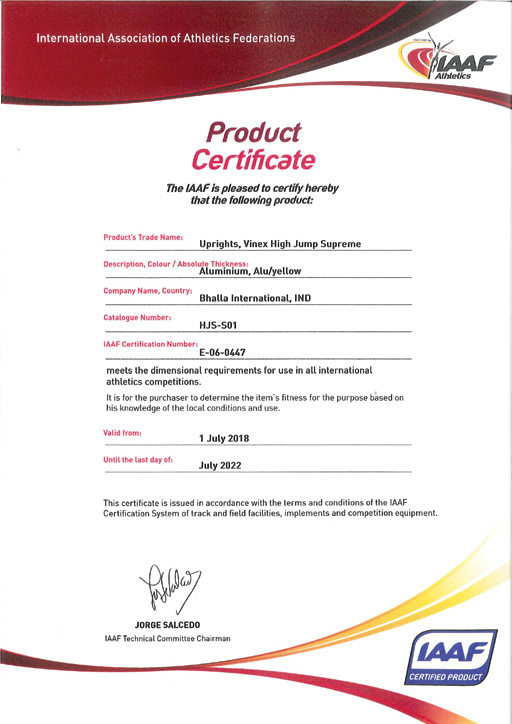 High Jump standards with 18 Inch� steel square base. Steel constructed risers with welded bar rests. Complies with International standards. Approved by IAAF. Height adjustment from 70 cm to 260 cm. Upright made of Anodised Aluminium profile with in-built Metal Measuring Tape. Heavy base made of steel, powder coated for extra durability. Height adjustment from 15 cm to 200 cm. Aluminium 1.5 inches square tubular pipe. Base made of rectangular steel pipe with weight. Height adjustment from 30 cm to 200 cm. As above in all steel tubular pipe construction.